Star Wars Day is just around the corner and I’m excited to share with you some of the best Star Wars illustrations and posters I was able to find on the Web. Enjoy and don’t forget to have a great Star Wars day this May 4th. Marko Maven is a conceptual mixed-media artist and illustrator born in Skopje, Macedonia. His work comprises print, editorial, and comic illustrations. 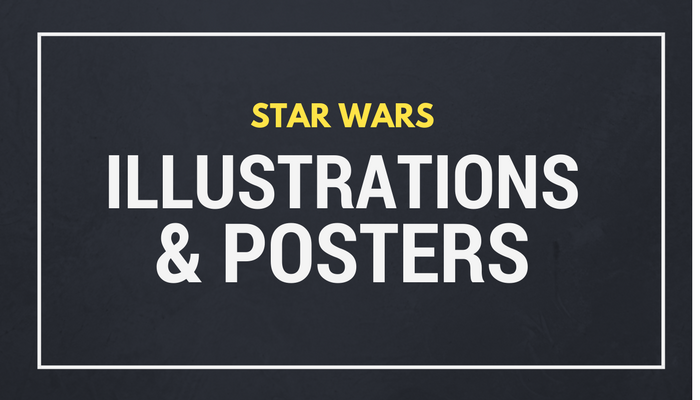 His Star Wars Trilogy posters have a raw, detailed look. The design mixes realistic and minimalist elements to create a whole new concept. Each one of the Trilogy posters is tinted in separate color that aims to best represent the atmosphere of the movie. The digital illustrations of Alessandro Pautasso are a unique twist of modern, abstract realism that creatively mixes geometry with a complex color palette. His Tribute illustration series follow the same concept. 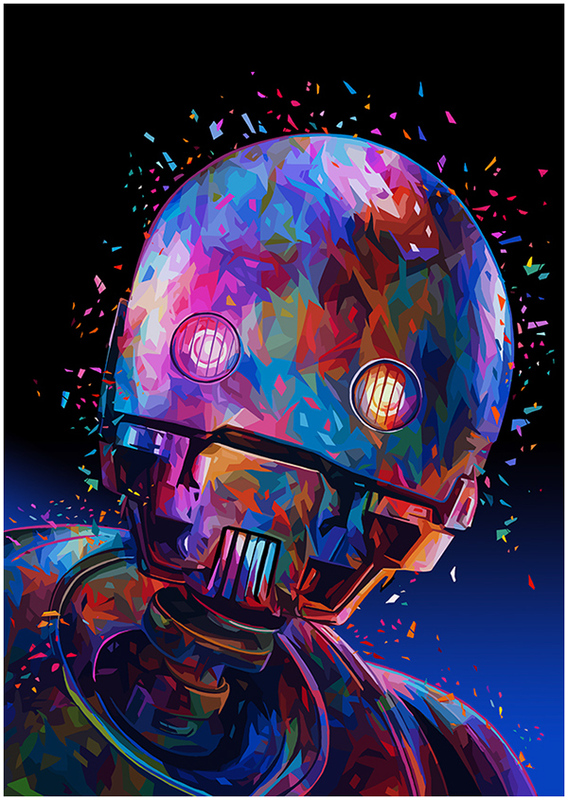 His digital art is infused with a splash of rainbow colors. The main elements elegantly pop up on a clean black background. Vesa Lehtimäki, also known as The Avantaut, is a Helsinki-based photographer, illustrator, and a HUGO Award 2017 finalist. The creative work of this artist has influenced the visuals in The Lego Movie. 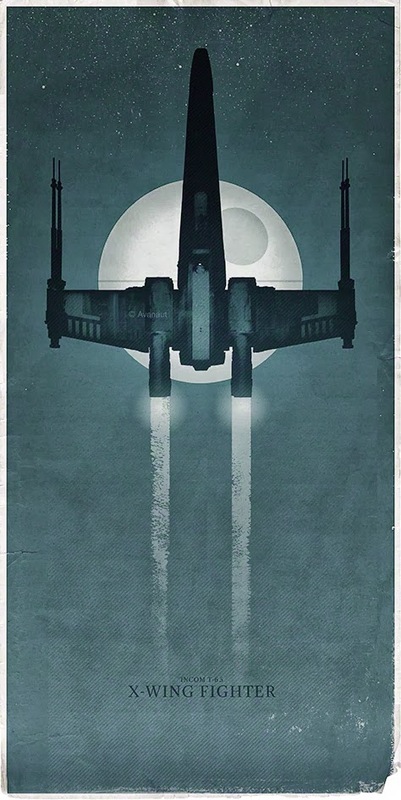 Vesa’s work is on the Star Wars ship poster series is inspired by the work of popular artists like Justin Van Genderen and Sana Sini, but it also has its own unique twist. Dan Luvisi is an accredited digital illustrator and concept artist with a vast resume of projects. 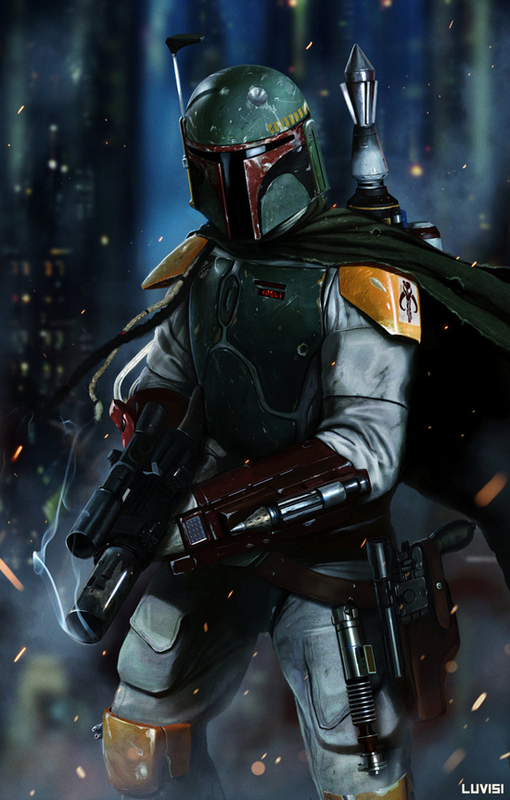 His graphic novel, named Killbook of a Bounty Hunter, was sold to Paramount Pictures. His illustrations are realistic and unique in their own way. They have a high level of detail and use a complex combination of colors that create an immersive appearance. Roberto Campus is a Florida-based illustrator who has worked with various famous publishers, like Lucas Arts, Marvel, DC, and Penguin Books. His artwork varies from ultra realistic to anime style. The book cover illustration featured in this post was commissioned to him by Lucas Arts for the Star Wars insider magazine. 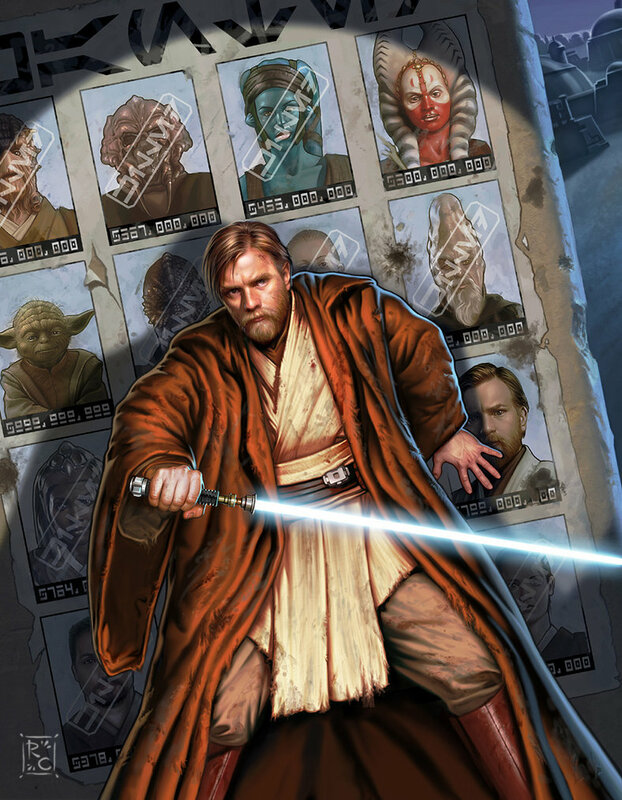 The cover illustration shows Obi-Wan Kenobi in front of a wall filled with wanted posters. These stunning retro Star Wars illustrations wonderfully combine the roaring 60s with the futuristic beauty of the Star Wars characters. 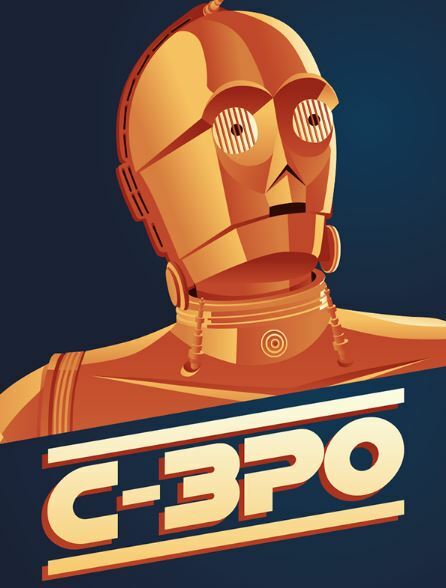 The two posters feature R2D2 and C3PO in a matching style. Both characters have a vintage hero posture that bravely stares towards the sky. The blue background ideally matches with the bright yellow headings and makes the main elements of the design pop up. The Digital Nursery is an UK design shop hosted on Etsy. Pete, the shop’s owner, describes himself as a solo creative that works in print in packaging. His printed posters shop was inspired by the need to decorate his own walls. All posters follow an Illustrator-based creative pattern and feature a rich color palette. 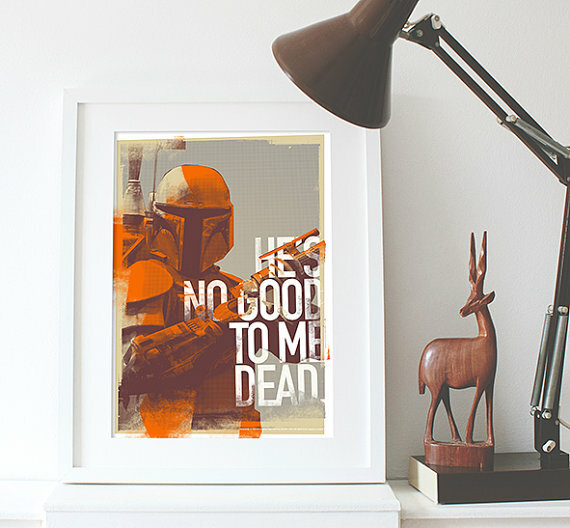 This particular Star Wars poster has a grunge vibe and mixes textures with modern sans serif typography. The creative artwork of the British designer Olly Moss has found its place among many bestselling books, movies, and games, like Harry Potter, The Firewatch, and others. 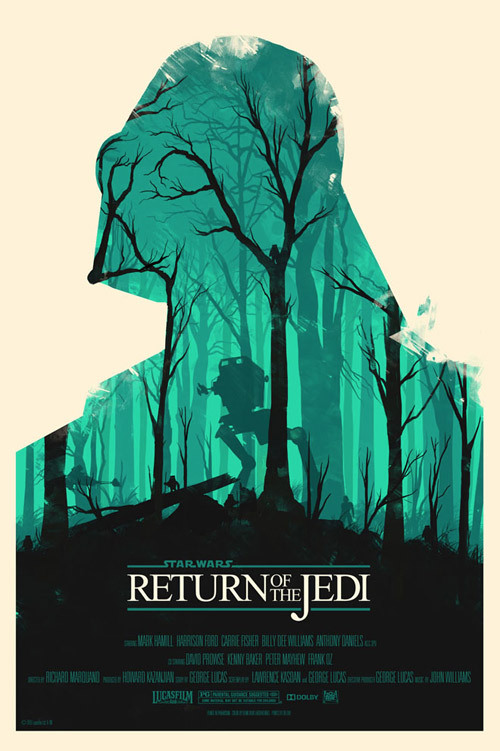 His alternative Star Wars poster features an illustration of the silhouette of Dart Vader which frames a lonely forest scene with futuristic elements. The Star Wars Identities Exhibition features different characters from the all-time popular movies by displaying them in a unique and creative way. The exhibition invites fans to find out their true Star Wars identity while exploring a fan world of 3d, mixed media, and digital art. 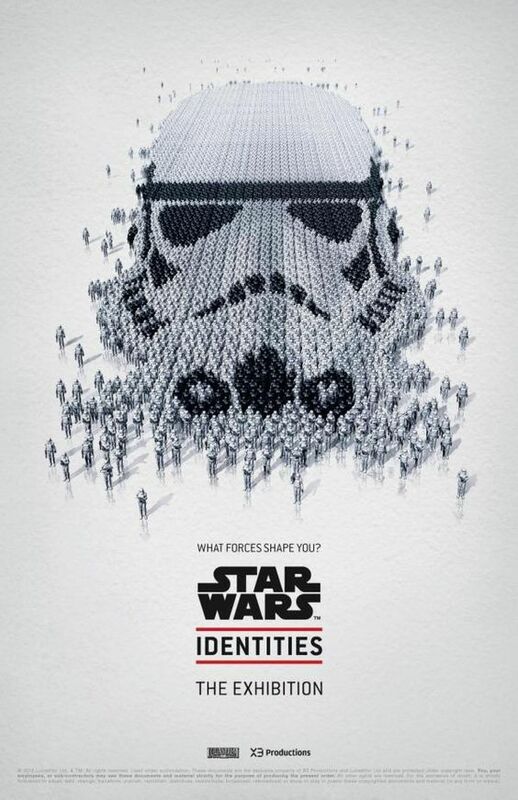 This particular poster shows storm trooper’s silhouette formed by a group of storm troopers viewed from a top-down perspective.